Then Progressive Conservative Leader Doug Ford Speaking in Sudbury, Ontario. POPULISM IN QUEEN’S PARK. Far-right populist movements have reached nearly every corner of Western democracy: the United States, Europe, and Oceania. The one holdout was Canada with Prime Minister Justin Trudeau’s progressive, liberal agenda. He has been a beacon of hope to many who can only see populist rhetoric and an attack on democracy around them. Yet, last night, in Canada’s largest province, Ontario, voters choose Canada’s first populist as their leader. 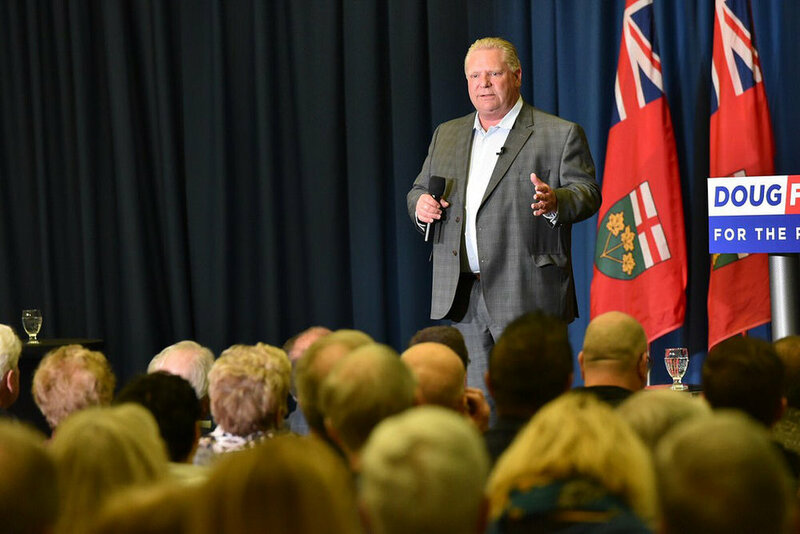 Like many, Progressive Conservative leader Doug Ford had few plans for Ontario’s economy, but played off rhetoric that drummed up emotion, attacked his opponents, blatantly lied and focused on superlatives. With that, he won a strong majority, cementing himself as Premier of the province with little in his way of opposition. Still, he is only leader of a sub-region government meaning power his is limited compared to other populists. Ontarians and others who hope to a return to better government can only give Mr. Ford a chance, but must keep him on a short leash. KEEPING YOUR ENEMIES CLOSER. President Vladimir Putin of Russia has made headlines throughout the last few years by violating the rights of citizens across Europe and playing politics in the Middle East. Putin has cooled Russia-EU relations to its chilliest point since the Cold War resulting in punitive tariffs on his country. Now with President Trump’s new tariffs on the EU as well as his withdrawal from the Iran Deal, United States-EU relations are at their lowest point since since the Iraq War, potentially longer. Putin has taken advantage of the situation, using a friendlier tone and encouraging warmer relations with the EU. As Russia-friendly Austria assumes the revolving EU presidency next month, it could lobby to lift sanctions on Russia. If the EU does not see a resolution to US tariffs in the near future, this closer Russia-EU relations could be a reality. AS SANCTIONS EASE, TRADE WILL GROW. Since the beginning of Trump’s presidency, he has coerced China to increase sanctions on North Korea in hopes of pressuring it to the negotiating table. While this strategy’s success is debatable, North Korea is now ready for negotiations and any solution that decreases its nuclear capabilities will likely increase its economic affluence. It already is continuing ‘grey market’ trade with China at its northern border and any deal is sure to improve the economic standing of a class of North Koreans considered to be easily targeted once sanctions are reduced. If this is in combination with denuclearization it could mean an engagement strategy that has the potential to enlighten the citizens of North Korea. 6 + 1 SUMMIT. The G7 traditionally seen as a relatively cohesive group of some of the world’s most powerful nations. While there are differences, the group tends to be in general agreement on most issues with points of friction being minor. This year is different and in a big way. The United States, the world hegemon, is the ‘+1’. Just days ago, the United States placed tariffs on Canada and the EU, which includes the other six G7 nations. While the summit has not begun yet, pre-summit meetings imply that they will make a strong message against Trump. Prime Minister Trudeau and French President Macron have already denounced the tariff decision. President Trump is creating a division through the tradition North Atlantic alliance and so far, the rest of the nations have united against him. PROHIBITION OF THE PRESS. With national elections in less than two months, Pakistan’s authorities, particularly its military, are pursuing a vicious crackdown on the mainstream and social media. With journalists being abducted, mainstream media blocked, and online content censored, the Pakistan Muslim League-Nawaz (the governing party) is mounting a campaign to prevent descent. Activists and protesters believe this is the most obvious denial of free press they have seen from the government. This continues to reinforce Pakistan’s increasing authoritarianism. PEACE AGREEMENT TO BE IMPLEMENTED. Ethiopia and Eritrea, its former province, fought a bloody war from 1998 to 2000 leaving 50 000 people dead and ended in a peace agreement, which has never been fully acknowledged. While the Eritrean government has always backed the agreement that established a clear border for the newly separated country, Ethiopia has never fully accepted it. Yet, the new prime minister, Abiy Ahmed, has vowed to improve relations with Eritrea including accepting the 2000 peace agreement, hopefully ending this drawn out dispute. PROTESTING THE MONARCHY. This is perhaps surprisingly unusual in Jordan. It’s monarch has reigned with relatively high approval in past years, but recently more people are becoming fed up with the system. Jordan has been able to provide its people with resources like a oil-rich Gulf state through employing nearly a third of its population publicly, benevolent subsidies, and low income tax. This has been accomplished in large part to good relations with its neighbours and being a benefactor of Saudi Arabia. With a Saudi recession and disruption in neighbouring Syria and Iraq, its economy has fell on hard times. This has resulted in numerous attempts at reforming their system. Yet, the monarch’s generosity has become so ingrained that the population has rejected reforms and wants the government to fix them problem without fiscal restraint, which is untenable. With elections coming up, the Monarch may be in trouble.